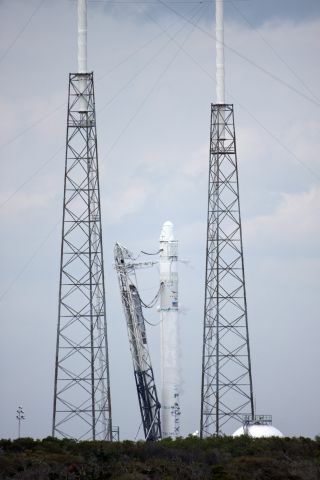 The SpaceX Falcon 9 rocket remains standing on Launch Complex 40 at Cape Canaveral Air Force Station in Florida following a test firing of the vehicle's nine Merlin first-stage engines. Image released Feb. 25, 2013. The private spaceflight company SpaceX is counting down to launch an unmanned space capsule to the International Space Station today (March 1) and you can watch the blastoff live online with two official webcasts. SpaceX is on track to launch a Falcon 9 rocket today from the Cape Canaveral Air Force Station in Florida to send a robotic Dragon space capsule packed with precious NASA cargo for the space station. Liftoff is set for 10:10 a.m. EST (1510 GMT), with an 80 percent chance of good weather conditions, NASA has said. Both NASA and the Hawthorne, Calif.-based SpaceX will provide webcasts for the launch to give space fans options to tune in. NASA's launch webcast will begin at 8:30 a.m. EST (1330 GMT), and may include commentary from space station officials, astronauts and other agency officials. It will be broadcast live on the NASA TV channel, as well as streamed online by the space agency. You can watch NASA's SpaceX Dragon launch webcast on SPACE.com,courtesy of NASA TV. SpaceX's webcast will begin at about 9:30 a.m. EST (1430 GMT), and feature a different list of guests and experts. It will be streamed live at SpaceX's launch webcast website. Today's launch is the third SpaceX mission to the International Space Station and second Dragon mission to carry cargo for the orbiting laboratory. SpaceX launched a demonstration flight to the station in May 2012, and followed it with the first full-up cargo delivery mission in October of that same year. SpaceX is the first private company every to launch a mission to the space station. The Dragon spacecraft launching today will carry about 1,200 pounds (544 kilograms) of supplies to the space station. It will return 2,300 pounds (1,043 kg) of experiment results and other hardware back to Earth on March 25 when the space capsule is due to splash down in the Pacific Ocean off the coast of Baja California — something robotic cargo ships for the station built by Russia, Europe and Japan cannot do. SpaceX has a $1.6 billion contract with NASA to provide at least 12 unmanned cargo delivery missions to the space station using its Falcon 9 rockets and Dragon space capsules. The company is also developing a manned version of the Dragon capsule, a spacecraft designed to ferry seven astronauts into and from space, in hopes of flying NASA astronauts to the station in the future. The other company is Virginia-based Orbital Sciences Corp, which is developing the new Antares rocket and robotic Cygnus spacecraft to fulfill its $1.9 billion contract with NASA for eight cargo missions to the space station. NASA is also working with four companies that are developing commercial manned spacecraft that may soon carry American astronauts to the space station. That group includes SpaceX, which was founded in 2002 by billionaire entrepreneur Elon Musk, co-founder of the Internet pay service PayPal, specifically to develop new low-cost rockets and spacecraft. Musk has said repeatedly in the past that his plan was always to pursue manned spaceflight with SpaceX. He named the Falcon 9 rocket after the fictional Millennium Falcon spaceship from "Star Wars" and the Dragon capsule after "Puff the Magic Dragon." Visit SPACE.com for complete coverage of SpaceX's launch today, as well as the Dragon's round-trip flight to the space station and back to Earth.